I adore coffee, so I wasn’t surprised when I came a cross a recent study, which found that drinking java is linked to positive emotions, including pleasure, kindness, affection, satisfaction, friendship, calm, and happiness. Coffee beans are actually the seeds inside a bright red berry, sometimes called a coffee cherry. Like all plant foods, both the berries and the seeds are rich in antioxidants. In fact, according to recent research, coffee is the number one source of antioxidants in the American diet. This is probably because one out of every two Americans starts his or her day off with a cup of Joe, while 75 percent fall short of the minimum recommended five servings of fruits and veggies. Still, those antioxidants do pack a pretty powerful health protecting punch (read on to learn more). In one recent study, scientists followed a Native American population, where the prevalence of diabetes was between 40 and 70 percent. Over seven years, those with the highest coffee intakes had a 67 percent lower risk of developing diabetes compared to non coffee drinkers, and this isnât the only research to reach this conclusion. To date, several studies support a link between coffee intake and diabetes protection, including Harvard research, which found that a six cup a day habit slashed men's diabetes risk by over 50 percent and women's by 30 percent compared to java avoiders. While the study authors donât recommend consuming that much (and I agree), they believe the effect may be related to coffeeâs antioxidant content, which protects against insulin resistance, a precursor to diabetes. Studies show that compared to non-coffee drinks, those who indulge are likely to experience a lower risk of colon cancer, liver cirrhosis, gallstones, breast and endometrial cancer. 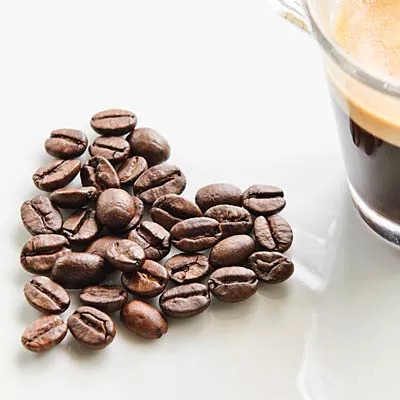 In addition, a handful of studies indicate that people who drink coffee on a regular basis are up to 80 percent less likely to develop Parkinson's, and there is strong evidence that caffeine plays a protective role. Based on this research, Parkinson's drugs that contain a derivative of caffeine are currently being developed. Several studies have shown that in moderation, caffeine enhances athletic performance. And now preliminary new research shows that exposing muscle cells to caffeine essentially mimics the effects of training. While this doesnât mean that drinking a cup of coffee is akin to a workout, scientists say the study may help to explain caffeineâs positive impact on boosting endurance. Another recent study published in the Journal of Applied Physiology found that muscle carbohydrate stores are replenished more rapidly when athletes consume both carbs and caffeine following exhaustive exercise. Compared to carbohydrates alone, the combo resulted in a 66 percent increase in muscle glycogen (the storage form of carbs) four hours after intense exercise. This increase in energy reserves ups your ability to exercise harder and/or longer the next time youâre ready to get your heart rate up. Animal studies show that caffeine may offset the loss of muscle strength that occurs with aging. The effects were seen in both the diaphragm, the core muscle used for respiration, as well as skeletal muscle. Other animal studies have found that caffeine may prevent brain inflammation, a precursor to cognitive impairment and neurodegenerative diseases, including Alzheimerâs. Caffeine is a diuretic, which means it triggers fluid loss. However, newer research indicates that after about five days of consistent caffeine intake, your body adjusts, which negates the dehydrating effect. The trick is, you have to be consistent. In other words, if you sometimes have one cup of coffee in the morning, sometimes three, or if you occasionally reach for it in the afternoon, you may feel the effects (headaches, dry skin, constipationâ¦). Natural substances in coffee have been shown to raise cholesterol levels. And two or more cups a day can increase the risk of heart disease in people with a fairly common genetic mutation, which slows the breakdown of caffeine in the body. In addition, if you have high blood pressure, you should limit your caffeine intake, and that can be tricky - since hypertension has no symptoms, you may not know you have it. Some people can drink a strong cup of coffee and go to sleep 30 minutes later. For others, even a moderate amount can cause stomach upset, anxiety, irritability, sleeplessness, and headaches. In addition, combining coffee with other stimulants can have a synergistic effect, which may dangerously raise blood pressure, even in healthy young adults. If you donât love coffee, thereâs no reason to start drinking it. And if you do, the pros above arenât a green light for cranking up your intake to a pot a day. However, it is good to know that if you have no intention of giving it up, your morning cuppa cuppa may provide some disease protection. To best reap the rewards, I recommend consistently sticking with just one cup in the morning, then switching to water or green tea. And if you do drink coffee, doctor it up healthfully. Stick with organic skim or plant based âmilkâ (almond, hemp, coconut, etc. ), and season it up with antioxidant rich, naturally calorie free spices like ground cinnamon, nutmeg and vanilla bean, rather than sugar or artificial sweeteners.